This Compton organ is based on the organ from the Gaumont Palace Chelsea. It was removed from the theatre and installed in Watford Town Hall in the 1960s. At that time, modifications were carried out to make it more suitable for ‘Dual Purpose’ work. Following a fire which damaged parts of the organ, the Compton was rebuilt by David Pawlyn in the early 1990s. This work restored a more theatrical specification to the console and saw the addition of some new pipe-work. In the mid 1990s the Colosseum was leased by the Town Hall authorities to a nightclub venture, which ran the building for several years. Unfortunately, during this time, the main cable between the organ console and chambers was cut and the instrument was rendered unplayable. During the latter part of 2006 the Compton was inspected by Robert Rowley of Pipe Organ Problems and Solutions Ltd and a report was prepared on its condition. Following this report, POPS Ltd was engaged to re-commission the organ. This work was completed in time for a civic opening given by Richard Hills in July 2007. The first in a new series of concerts on the revived instrument was given on 12th March 2008 by Robert Wolfe, who started his professional playing career with an engagement on this very instrument. Described as one of the very best Compton organs anywhere in the country, this instrument makes a terrific impact in the hall and is one of the most versatile civic instruments in use today. 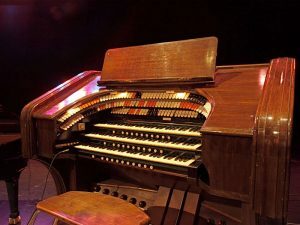 Following a major refurbishment to the venue in 2010-2011, Watford Borough Council commissioned the organ to be returned to its full and original standard. After completion of the refurbishment of the venue, the organ was used during the opening gala concert at Watford Colosseum by the BBC Concert Orchestra, and will remain a regular feature of concerts in the venue.